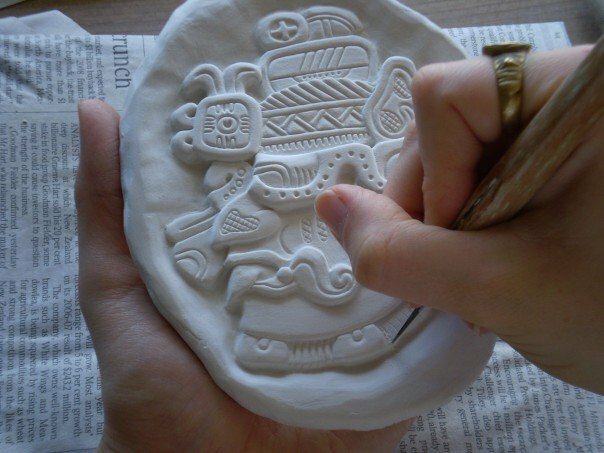 I’ve been working with ceramics for as long as I can remember; I’ve wanted to make my carvings for the entirety of my working life; and this is what I see myself doing well beyond retirement. I moved to London from Australia in 2008, which turned out to be unfortunate timing in terms of the economic crisis. A series of minor disasters just before flying over had decimated my savings so I went from being comfortable and confident that I could support my new life to being almost broke, sleeping on a couch and suddenly realising that it was much harder to find a job than I’d expected. I had spent the last few years working on carvings in my spare time (my historical series) but they were back in Australia where I intended to return in an indeterminate number of years, they couldn’t help me from halfway around the world. Nor could they have been of use once I’d advanced from the couch into the illustrious world of renting a room that was so small that I could touch both walls with outstretched arms. And didn’t have a wardrobe. Short of gatecrashing Buckingham Palace I didn’t like my chances of finding a property within Central London that would have the facilities to be able to set up a pottery studio and kiln. Getting back into pottery was a dream that had to wait until I’d found a job, worked myself up off being flat broke and bought a place of my own so I’d never have to worry about landlords screaming about the prospective fire hazards of a 1,250C toaster the size of a washing machine. As it happens, that’s exactly what I did in early 2013. 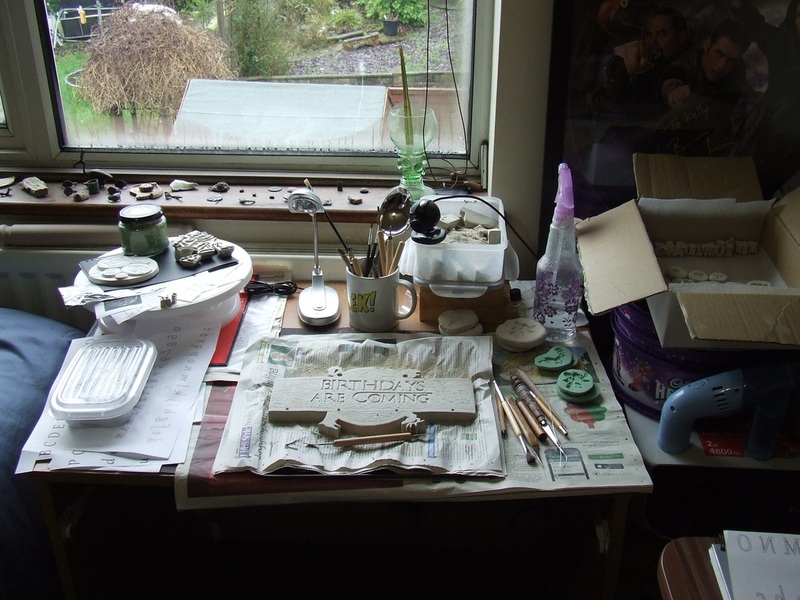 I now own a lovely place in Kent, a well-insulated shed to put the kiln in and a wobbly table at the end of my bed that I affectionately call ‘my studio’. It’s cramped, it’s basic, it has things piled up in stacks that defy at least three laws of physics, but it works and I love it. Currently my time with clay is limited by a pesky little thing called a day job, but by working for a few hours on the carvings each evening I’m getting closer to a time where I can focus on ceramics entirely – something I never thought possible while in England. And despite the dreary weather and horrendous winters I’ve come to love this country, so shortly will be flying back to Australia to pack up my historical series of carvings and ship them back over here. It will be the instant influx of over 25 new designs, representative of several years’ worth of work. In the meantime I’m concentrating on building up a science fiction and fantasy range of carvings. I’m not sure why it didn’t occur to me when I was back in Australia – possibly studying up to Master’s level in Archaeology and Egyptology may have biased my priorities – but sci-fi and fantasy designs look fantabulous in clay. Take a look around the site and I hope you'll agree with me. I have videos on youtube recording the whole process, so you can watch a piece emerge from a featureless slab of clay into a detailed sculpture. And finally, if you would like to support my livelihood and own a piece of your own, please head down to my Etsy store - I have carvings for sale both in the United Kingdom and the United States so as to reduce shipping costs.